Oh my goodness, these two are so full of light! 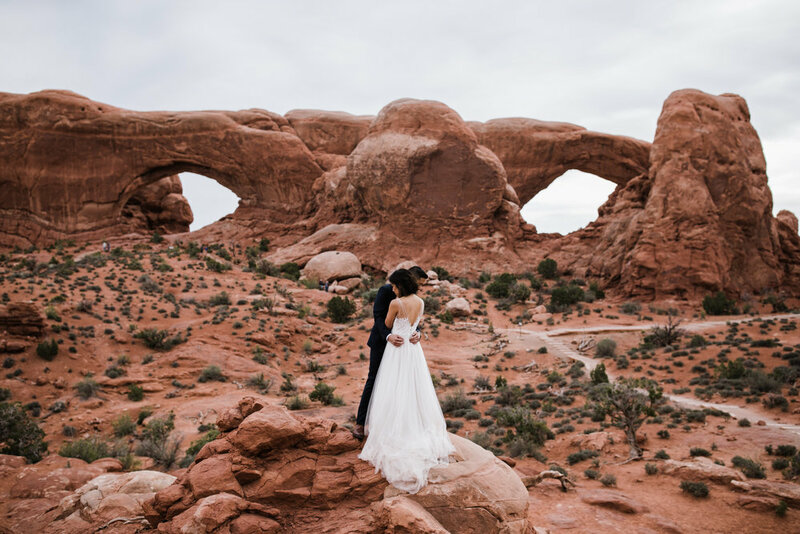 After deciding the traditional wedding wasn’t for them, they chose to take an epic elopement roadtrip through some of the national parks in Utah to eventually meet up with a few friends in Salt Lake City for their intimate ceremony in the mountains. 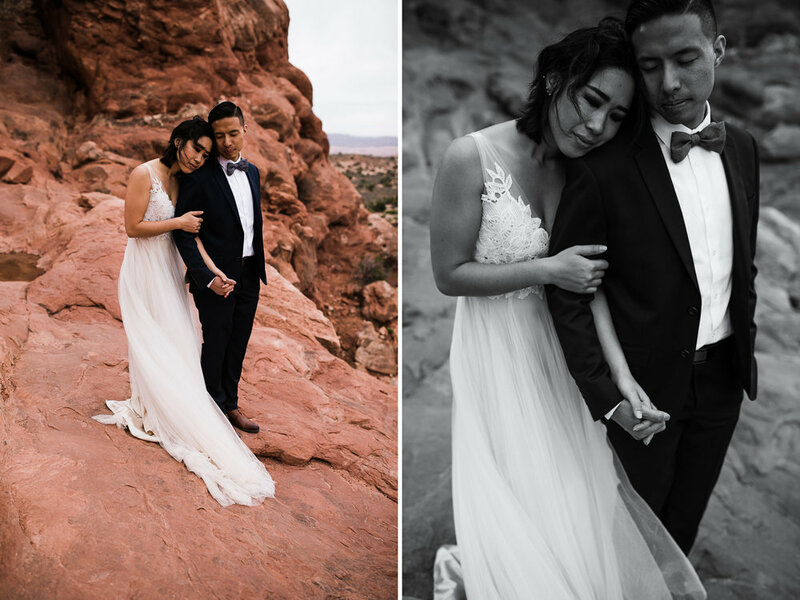 When they originally reached out to us to shoot their wedding, our schedules weren’t going to line up for SLC, so they decided to meet us for a first look portrait session in Arches National Park on their way through Moab instead! We decided to do their session at sunrise to ensure they’d have some privacy considering the National Parks can be pretty crowded, and we were so glad we did! We all met up in the early morning and I helped Jenny into her dress in our van (did you know it doubles as a bridal suit? 😉) while Callen and Yun hiked out to a little saddle between two huge sandstone formations. 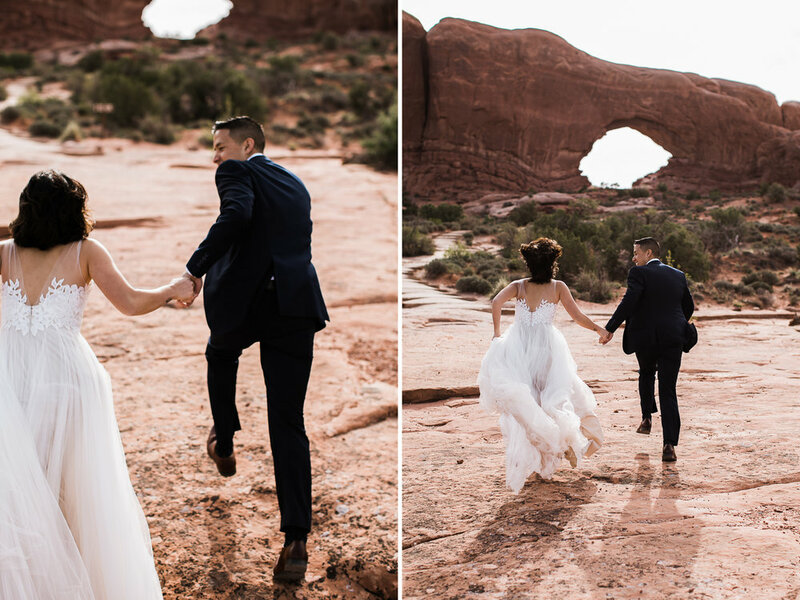 They shared their first look, full of laughs and tears, up above the desert with the La Sal mountains behind them. We spent the next few hours hiking around the park, climbing up below massive arches and enjoying the peaceful morning. Jenny was a total adventure bride climbing up and down the rocks with her hiking boots and gorgeous flowy wedding dress! We all had so much fun hiking around and chatting about our dogs, van life, and everything else. It was such a perfect way for them to get excited about their upcoming wedding and get some epic photos at the same time. This has nothing to do with the session, but I just have to add that afterwards Callen and I drove less than three minutes down the road and I climbed my first desert tower right there in the park! It was so fun, and is 100% why we love what we do. How cool that we get to take epic photos with some of the coolest couples, and then as soon as we say goodbye, we're climbing on some classic desert towers?! Best job ever! If you like the idea of eloping, but still want a more traditional wedding, doing an adventure session with us in your wedding clothes might be a good option! We love when we get to do adventurous wedding portraits for our couples, even if they get married elsewhere! This would be such a fun way to plan an epic honeymoon and get more rad photos in your wedding attire. 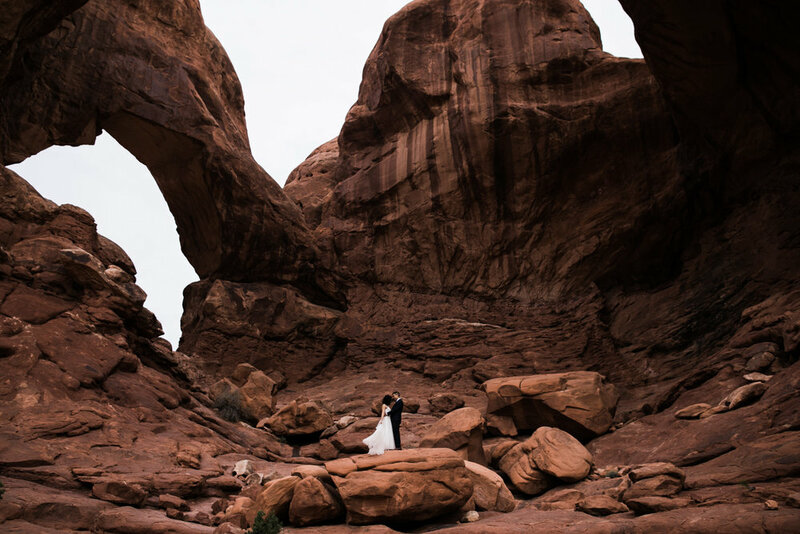 We’ve photographed a lot of weddings and elopements in Utah (especially Moab!) but this was actually our first time shooting in Arches National Park! 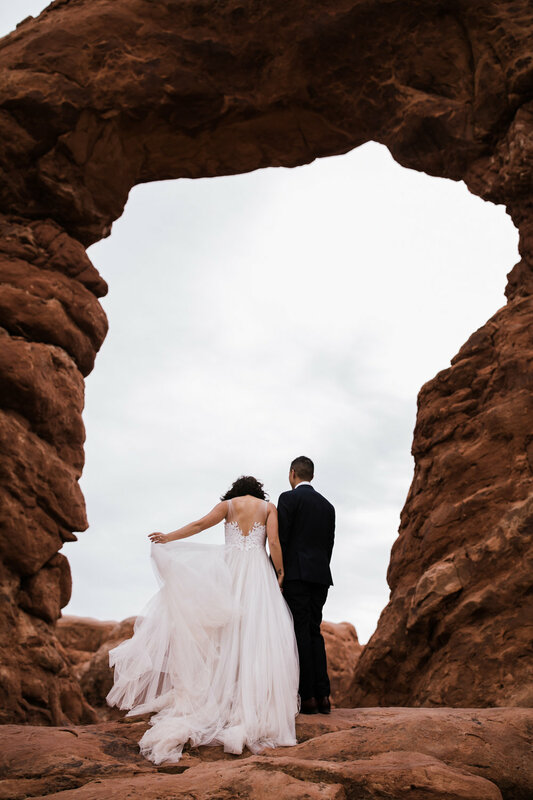 After hiking there so many times, I’m really glad one of our couples finally wanted wedding portraits in the park — it’s seriously so epic and the arches are absolutely insane. 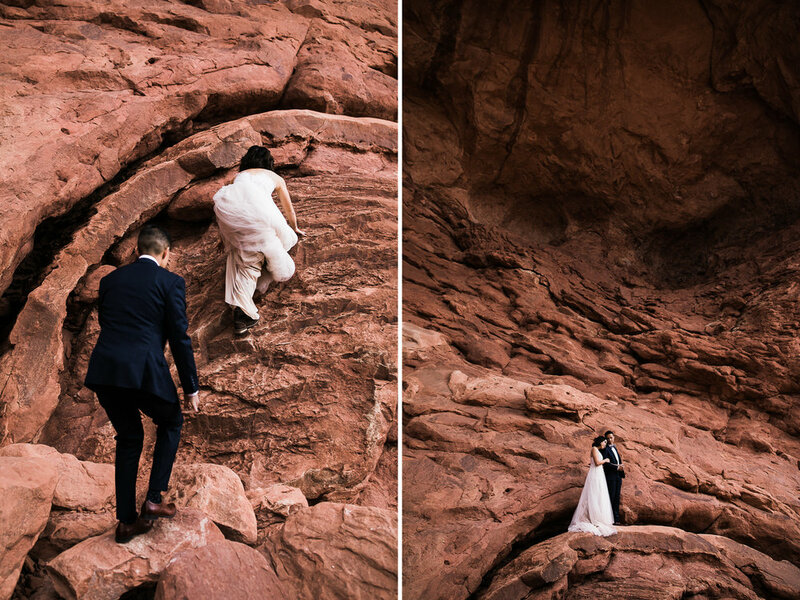 We highly reccomend Arches for couples that aren’t comfortable with heights, don’t have a lot of experience hiking, want to include family in your ceremony without making them hike, or just love the look of these crazy sandstone formations.